Our Best Restaurant Meal in Manila This Year – Brava MAMOU!!! There are meals that are “technically” rated over the stratosphere… these are meals done in restaurants that consider their food almost an art… In the U.S., for example, where I have dined at better restaurants more often than in Europe, I find that the French Laundry, Le Bernardin, Restaurant Daniel, Le Cirque, etc. could all fall into that category and I have experienced several wonderful meals at many of these restaurants. The meals are fussy, the portions small, the ingredients rare and costly, the settings superb, the flowers gorgeous, the staff ranging from stellar to supercilious. Overall, each dish is generally technically well done, possessing flavors and combinations you wouldn’t really attempt at home. The Michelin starred restaurants in Europe are sometimes even a notch higher up the ratings scale. I haven’t had much experience dining “at the top places” in Europe, but I can say vicariously, that Sister has made the rounds of more three-starred Parisian restaurants in the past couple of years than anyone else I know. I think she has a personal quest to hit all the top rated places before long. Sometimes, she hies off from a group of travelers or relatives and savors a three hour, three star meal BY HERSELF as a rare indulgence, I wouldn’t want to be the chef at the restaurant if Sister was dining there ALONE. I would be less scared if the reviewer from the New York Times were at the table instead. If she had a well visited food blog, she could close a restaurant with a single post. Heeheehee. These “starred” restaurants are in a class all their own, and on reflection, are often totally worth the seemingly outrageous $150+ per head you would have to pay these days, without wine. Mamou is NOT fine dining. It claims to be a home kitchen, and that is being a bit too modest, but not really. More than most restaurants at the new Serendra complex, this one has a good dose of HEART. Malou Fores (Mamou to some), sister-in-law of Margarita Fores, has been in the Mamou kitchen since the day it opened, several months ago. Malou’s sister, Annie, helps out in the restaurant proper. Malou cooks hearty dishes that evolved from the dishes she cooked for her own family. While the restaurant itself is visually attractive, a combination between a snazzy Parisian Bistro or Brasserie with red and black accents, but in a new mall, it isn’t the most relaxing place to hang out. The chairs are a bit uncomfortable and the din and noise high despite the clever use of eggshell foam under the tables. It has a huge window into the kitchen, which bustles with frenetic activity of the red-capped chefs and cooks on a busy night. Space is tight, neighboring tables are close by and the rent is obviously high. Perhaps that is the reason they have some chillers with steaks in the main dining area. So no, the physical environment wasn’t a slam dunk for me, but it was lively, bright, vibrant and young. Somehow, the lack of pretense or overly interior-designed space is a plus for me… And it’s a nice touch that bottles of all my favorite condiments (ketchup, worcestershire sauce, mustards, cider vinegars, etc. are stacked on the counter near the kitchen… just like home). For appetizers, we had several orders of cracked cheese with honey and fuet. This terrific pairing of salty cheese, with sweet honey and fat salami. Yum. I have done a version of this at home with my guava jelly or kalamansi jelly and it is delicious. Served with warm baked in-house bread rolls with a fine dusting of flour and the evening is off to a good start. 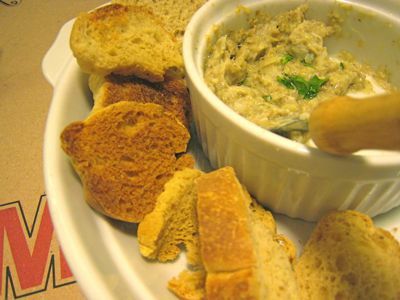 Next, we had a truffle oil vegetable dip with melba chips that belies the link of Mamou to The Blue Kitchen, where delicious dips are a long time staple. I think we also ordered an artichoke dip on another visit that was very good. Next, we had several orders of fish and chips with a batter infused with cerveza negra. The fish and chips were excellent, served with malt vinegar, straight out of the Heinz? bottle. :) The batter was crisp, light and flavorful. 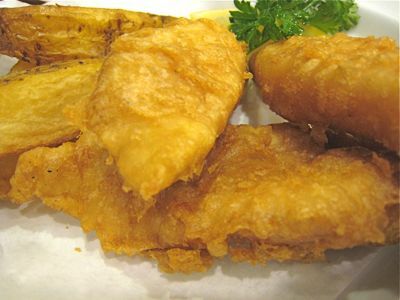 The best fish and chips we have had in Manila. 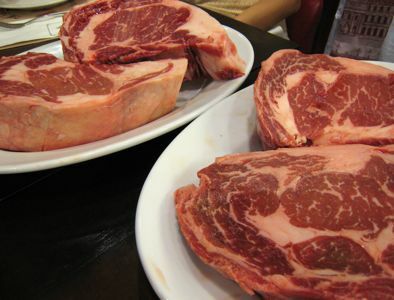 We ordered several huge steaks (get the big ones, the small ones aren’t as succulent, I think), with all the possible sidings such as mashed potatoes, white rice, red rice, creamed spinach and corn pudding. The steaks were SUPERB. Done very nicely indeed. Just a tad more watery than say a brilliant steak at Peter Luger’s but pretty gosh darned good for Manila. I think these steaks were wet aged, and apparently from a terrific supplier. Some of the side dishes were a bit blah, and the portions skimpy, so think to order more if you are starch dependent. The red rice sauteed in steak fat is heaven. A house specialty and certified home run dish is the Roast Pork and Chicken served wth rice, buttered onions, saba bananas and black beans. This has shades of a Cuban or Central American dish and it is comfort food at its best. Order the large portion and share it. In fact, if I were sneaking into Mamou for a solo lunch or with a friend, I would order this and a salad and be totally satisfied at a very reasonable total tab. The one clear stumble was an order of Crispy Roast Duck that the Kid ordered. She is a big duck fan and quite tolerant of most versions, but I have to agree that this particular dish was a bit too dry and not a hit. It has since been taken off the menu, I gather. Finally, we tried nearly all of the desserts. But here I have to say I am a bit biased as I bake myself. The pecan pie was good but not brilliant (needs more nuts!). 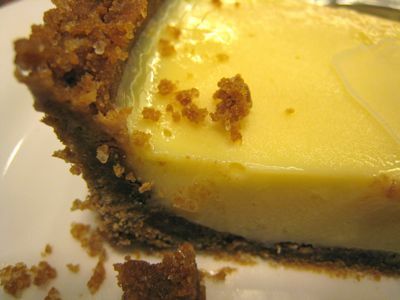 If you want to clear your palate try the key lime pie. They also have a Dark Chocolate Sans Rival as well. If there are many of you dining, order a selection of desserts and just share a few forkfulls each. Alternatively, you can head to one of several dessert places in the same complex. So why was this the best meal we had in a restaurant this year? Because the food was extremely good overall and reminiscent of hearty, comfortable home-cooked meals of a different era (for most, anyway), because we dined with very good friends, because we ordered with abandon and ate like there was no tomorrow, because it all just felt right that night. Some meals are just memorable and this was one of them. It took me many weeks to write this review, as I pondered whether I should post this meal for public consumption (for fear that I will never be able to get a table at Mamou again), but selfishness has given way to sharing this gem of a find with my readers. Oh, and I almost forgot, our meal, for 7, cost roughly PHP1,500 per person… but we ate enough for 12. As I said earliler, there are those who will get what Mamou is about and those who will miss the point entirely. We get it. Brava Mamou!!! You have a definite winner!!! Bravo to BRAVA MAMOU!!! Great post…it makes me hungry. We love Mamou!!! Definitely, a must try on any foodie’s list. What’s the price range per head? Best restaurant this year? High praise … another reason (in addition to my fussy dad saying he really liked it) to add this to my list of restaurants to hit during my whirlwind 1+ week back in Manila. Re: the pdi review if they give Mamou only two out of five stars then what would be a five star restaurant in Manila? I have had many good experiences in Mamou and a few disappointments. The Steak for two is the right size for balancing a crust along with medium rare doneness. It would be world class if the meat used was a dry aged porterhouse.I find the price reasonable considering the food cost. The mistakes that they have made during some of my meals could probably be attributed to high volume. I just feel that it is important to support the better restaurants in Manila lest they end up in the restaurant graveyard. Glad to know the duck’s been rotated off. From our experience and others who’ve shared their take of the dish, it’s missing something. Maybe they can do a confit of duck instead. I do hope this place stays afloat, solo lunches there are far more pleasant than wrestling with the crowds at night. 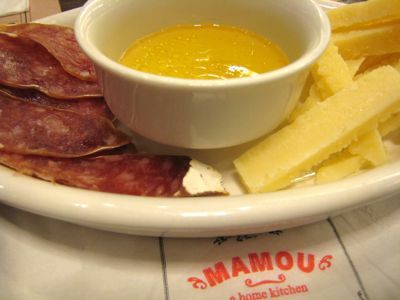 Hmmm… will have to try Mamou the next time I am in Manila. When I was there a few months ago I ate at three different restaurants at Serendra and liked all of them. Unfortunately Mamou wasn’t among those three… Abe was one of them but I don’t remember the other two. oh, as an aside… dinners at the French Laundry are now $240 per person (including service charge), without wine pairings. :-). I recently got an invite to a truffle-themed dinner there… $995 per person. Haha. Waaay too rich for my blood. Wait till you see what Santa has tucked into your stocking… Yes, one more trip to Paris in April and all the 3 starred restaurants will have been visited by the LONE DINER. Every meal has been worth every euro spent with the exception of Lucas Carton, that rightfully lost one star. I could have predicted that in 2006. Thanks for the good review of Mamou at least I know where to dine when Aladdin and Genie take me toward that direction. With all the new restaurants popping up like a mushroom – each one offering their house specialties the good one always stands out in the crowd and stay in business! I would say it is really competitive market in the restaurant arena now which is good for diners! RICE SAUTEED IN THE LEFT OVER FAT FROM YOUR STEAK. This, in all its all-caps glory, may be the best hunger inducing line I have read in your blog. Your sister’s new challenge: all the starred restos in Japan! The new Michelin guide for Japan has nearly 200 restaurants, and more than enough 3 star establishments to keep her busy till 2010. I am in the process of dry aging several slabs of USDA Prime Rib-Eye meat. I got the slabs frozen from a local supplier. After more than 10 days of aging, I’ve noticed some change in the color of the fat from a creamy white to a yellowish hue, and there was a weight loss of around 6%. I made some into a roast beef (medium rare) and it came out really great, very tender and not at all watery. I’m going to age some of the meat to the 21-day level, then see if there’s more room for improvement. The only question in my mind is if it’s perfectly acceptable to dry age previously frozen meat. The purists say that you can’t dry age previously frozen meat. But living in the Philippines forces you to innovate with your technique. Its great that you are experimenting with dry aging. Keep it up. 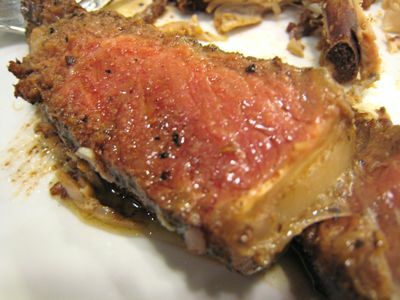 Heston Blumenthal, a famous molecular gastronomist, has developed a technique for getting the “dry aged meat” taste without actual aging. 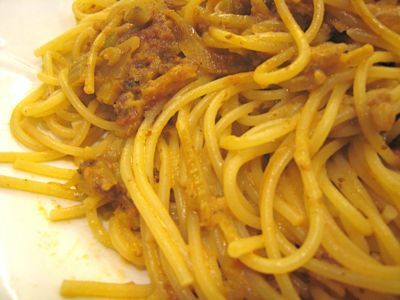 The technique however involves controlled low temperature cooking (a risky proposition because of bacteria growth unless you are cooking in a vacuum). Try to refer to his first book called “In Search of Perfection”. and i seat here in front of the computer salivating. damn! Thanks APM. I am familiar with Heston Blumenthal and his kind(Ferran Adria, Thomas Keller, etc. ), but haven’t read his method of aging. I have both a thermal circulator and a combi-oven, as well a cheap vacuum sealer. I’ve been experimenting with sous vide cooking with mixed results. I will definitely not do a sous vide roast beef since the low temp., long cooking time, and the oxygen free nature of the method creates the perfect environment for the botulism bateria. I have done sous vide steaks, which I then seared on a hot pan. Since I was able to control the temperature to an accuracy of .5 degrees, I was able to come up with a perfectly cooked steak, with a uniformly pink interior. We’ve also been able to come up with an unbelievable boiled egg that took 1 hour to make. The method isn’t popular yet, so getting recipes isn’t that easy. It’s a trial and error process for now, but hopefully I’ll be able to get the hang of it soon. This is my first comment ever – on any blog. The Mamou experience was just so odd for me I felt the need to say something. We must have been there on a “salt fiesta and bad waiter” day. FOOD: SALTY! From the bread to the steak. I couldn’t believe it when they gave even MORE salt to put on the steak. Then, even more salt came to add to the drinks. Admittedly, I have always been on a low salt diet but I seriously had to stop eating because my tongue hurt. SERVICE: Waiters (Francis and this other guy who made me want to pull my hair out) seem to be dazed. I asked for milk with my coffee and kept saying “Oh, no coffee – milk only?”. You’d NEVER find service like that in a traditional home. We had to ask for glasses of water many times. They do NOT refill glasses – need to badger them. Liquids on the right seemed to be a new concept. Utensils were incomplete. Had to ask for a fork … many times. Waiters would constantly reach OVER a guest’s plate to serve, clear, you name it … I had an arm IN FRONT of my face. I was stressed out that his sleeve would end up IN MY FOOD next. Waiters lacked a sense “personal space”. FOOD: Whatever you do, do NOT have the duck. DRY took on a new meaning with this dish. INTERIORS: OK, I guess. I found it disconcerting that the restaurant was new but the walls were dirty and the floor tiles were missing already. Fortunately, I was there to have dinner with a group of good friends. The company made up for the “arm in my face” intermissions and de-salination breaks to pacify my tongue. I also have a thermal circulator and am currently ordering a chamber vacuum sealer. I think that you have everything in place to make a good sous vide roast beef. I do have some sous vide recipes and am going to work on some foie gras when my schedule opens up.I have a friend who has used the technique extensively having worked in Per Se for an extended period of time, let me know if you would like to compare notes. Henry and APM, please say you live in CEBU!!!! MM, let me know the next time you come to Cebu. Have been pretty busy with my “little project” on top of the Christmas orders. This is the first time in days that I have been able to visit your site. Got to go, have to head back to the salt-mine. Sorry, Manila boy all the way. Here’s the results of some of the stuff we’ve done. We’ve only had the circulator for a month and it’s been so hectic recently that I’ve hadn’t had time to really use it. Skinless Chicken Breast – 145F for 4 hours- Doesn’t have to be that long but I thought the whole point of this method was that you could leave it and it wouldn’t overcook. Result – A bit too dry, maybe I should use a lower temperature. 1.25 in. 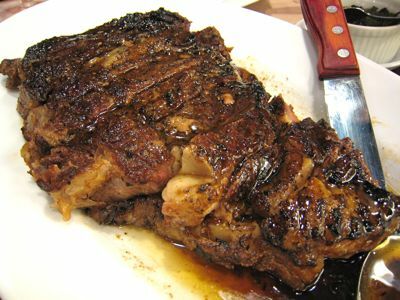 thick Rib-Eye Steak – 128F for 30 minutes, then pan seared for 1 minute per side – Result – Excellent. Not really the best use of the method since I feel similar results could be obtained by searing then putting in a low oven but it does make cooking steaks much easier and accurate. Skin on Pork Belly – 160F for 20 hours. Result – Mixed. The meat turned out really tender but the skin turned into gelatin. Tried to pan sear the skin but wasn’t really happy with the result. Salmon Fillet – We’ve tried several temps for this, from 100.4F to 115F. The thing is we only get frozen salmon in this country, and the lower range of the temperature band yields rather mushy reults, rather than the jelly like texture we were hoping for. I think it’s a safer bet to go to a higher temp. Will have to try the method on fresh lapu-lapu fillets. Eggs – Whole eggs at 148.1F for 45 min- Results – excellent. The perfectly poached egg according to Thomas Keller. It’s the no brainer sous vide starter, but be careful that the eggs don’t crack. The albumin might get into the circulator and muck it up. Roast Beef – We put it in the combi and set the temperature probe at 131F. The oven automatically seared it then lowered the temp. It took six hours or so, but the results were fantastic. Haven’t tried sous vide on this yet , but the low oven temp. approximates the results. I have Joan Roca’s book on Sous Vide, but he has a different approach to the method. He usually sets the circulator temp. higher than the product’s final temp. He then gives the time it normally takes to reach the product’s target temp. This is a safer approach from a food safety standpoint, but I usually just aim for the target temp. and leave it for a longer period. Lastly, I don’t think I’m getting the proper sous vide experience since I’m using a cheap vacuum sealer. It doesn’t really produce a tight enough vacuum, which I think is one of the reasons the chicken breast came out dry. I’m wary of doing foie gras since Roca’s book specifically said that to get good results, the vacuum must be really tight, otherwise the whole thing might just turn to oil. Hope this helps and good luck with your cooking. Two things about roast beef. Heston Blumenthal thinks that the proper temperature is 120 for 18 hours. The Chef at Gulliver’s once told me that they use their convection oven for 45 minutes at three fifty then keep the whole roast beef in the food warmer overnight (what about bacteria?). I am going to order my chamber vacuum sealer by january. My friend who worked for Keller has everything but the Rational combi oven (his equipment was even used in Per Se when their equipment broke down). I intend to concentrate my experiments for now on skinless pork belly, beef cheeks, tripe, and chicken. The rest of my experiments would have to wait for my vacuum sealer. Thanks for the recipes Henry. Keep in touch. I don’t publish my email address but if you could ask Market Man for it drop me a line so we could compare notes. Sorry artisan chocolatier but I am Manila based and so is my friend. APM mentioned this thread to me. Just wanted to put in my two cents on sous vide…. Best way to do eggs without risking mucking up your circulator is to put 148F water in a ziplock bag, put your eggs in the zip lock bags and submerge the bag in the water bath. As for serviceable chamber vacuum sealers (chamber types allow you to vacuum seal liquids without having to freeze them prior), the Ary Vacmaster SVP-10 is the cheapest i’ve found. You can get them at cabelas.com for around $1300. I just read in Roca’s book that 100.4F is supposed to be the best temperature for salmon, but as I said earlier, I wasn’t happy with the results. Before we got the circulator, we were using the Rational Combi at 122F for around 15 minutes with better results. We’re actually going to test 143F for eggs for 3 hours and see how it comes out. 148.1F for 45 min came out pretty good, but 147F for 3 hours was a bit to firm on the yolk side. As for the pork belly, is the purpose of the fan to dry the skin or to cool the whole belly? I was thinking of blast chilling the whole thing then putting it in a hot convection oven. I did put chilled butter in the olive oil brushed chicken, but I left it in for 4 hours at 145F to see what would happen. Either the target temp was too high or vacuum wasn’t enough. Will probably get a chamber type sealer next year. To MM, thanks for allowing this discussion on your blog. I’ve actually given a fake name and e-mail address since I’m not really comfortable giving out my real e-mail and would rather remain anonymous, but I’ve provided my real e-mail this time if either APM of Stagiaire would like to get in touch with me. Sorry about that. Henry, Stagaire and APM… for once, I am totally stumped by this highly technical discussion, but fascinated nonetheless…so nice to see several readers able to intelligently write about the subject at hand. I don’t normally give out anyone’s email address unless there is explicit approval from both sides, so if you folks want to exchange emails, let me know and I will fire them off to you… otherwise, for the vast majority of readers, I don’t typically do that. Nor are your emails visible to any other reader unless you post them in your comment. Thanks. That’s definitely a must-try, and thanks for sharing the contact numbers. :) THAT is the most important piece of information here — a way to make reservations! From your description of your overall experience, I think this is my kind of resto or place to hang out with friends and family, and enjoy great food and company! I’ll keep this in my kist of places to go to/visit when I go back home! Thanks MM! Dear MM,On behalf of the team at Mamou I would like to thank you and your readers for the reviews and comments on your dining experience at our Home kitchen. Since our opening last July 23 we have been humbled and overwhelmed by the reception we have received from you our valued clients. At Mamou it is our hope to be able to provide a dining experience that allows one to enjoy a meal with family and friends that is h opefully have a pleasant time as well. I know there have been occasions where we have not been able to provide the level of service that our clients or we expect, and for this we humbly apologize. It is our policy at Mamou that should the dining experience not meet ones expectations; we ask that any one of our staff be notified so we can rectify the deficiency immediately. We try time permitting to replace the item or if not its on us. As for the experience, we are constantly trying to improve on our service and your and the other readers views are a constant source of information. We thank everyone for their comments as this is the best way for us to continuously improve our service. Happy Holidays to one and all! Mamou, thank you for your comment, and thank you so much for letting all of the readers know that you and your staff are so committed to constantly improving the Mamou experience. I don’t typically readily use the phrase “The Best” for many of my posts so I do reiterate that our meal at Mamou a few weeks ago was indeed the best restaurant meal of the past year for Marketman… Have a great holiday season! Am not a hotelier nor restauranteur, but we do have a home based food business. I am still playing around with the sous vide method, but am also interested in the alginates and gums to come up with interesting textures. Suprisingly, I saw CIGI promoting the use of liquid nitrogen in culinary applications. I ate at Mamou today. The steak was a little salty, but Mamou generously offered to replace it. I declined – the food was still much better than I had expected (and MM’s post made me expect a lot). I will be back to try the rest of the menu. Wylie Dufresne (WD-50 New York) is an expert in what you are saying. I came across a DISCOVERY CHANNEL episode which talks about using liquid nitrogen in making instant ice cream. try to get hold of a copy of NEXT IRON CHEF (REALITY SHOW). 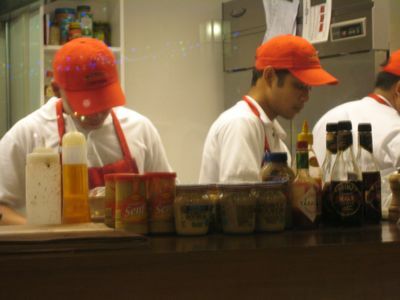 In one of the episodes, chefs were ask to use non-traditional method of cooking. it would be something that will interest you. I love Mamou’s Roast pork and chicken…certified comfort food!!! The sweet plantains balance the salt in the roast pork. and the beans that melt in your mouth…ahhhhh. I’ve heard great things about mamou’s food from friends and food blogs alike, so when my fiance and I decided to eat there last night, I had my expectations set real high. I wasn’t disappointed! I’m not really a fan of meat because I prefer seafood, but I must say and agree with everyone who has been raving about their steak that each bite will really melt in your mouth. 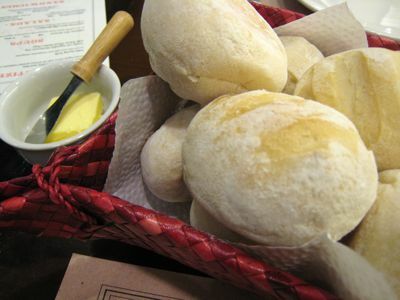 Their bread was also excellent, soft and chewy, the way I like it. I didn’t get too excited with their beer battered chicken though. I should’ve ordered the Roast pork and chicken instead. I have tried dining at Mamou twice and I intend to go back as often as I want–except that busy skeds and distance get in the way. So far, I love everything I tried. I don’t recall all the items I tried but I must agree with everyone else that Roast Pork and Chicken is a stand-out. Choose the red mountain rice! It gives the dish a distinct taste, which I love. Pork and chicken is roasted to perfection! 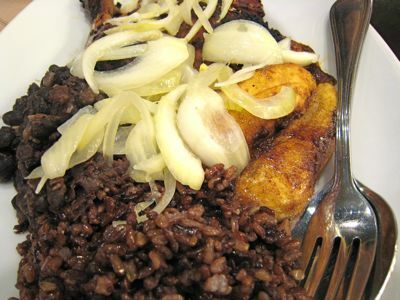 And the black beans and sugar-glazed saba, together with the red rice, gives it a fresh Cuban taste. This tastes like chili con but hardly: it’s much much better!!! Anyways, service can still be improved. During my first time, I talked to a waiter who didn’t know quite well all he disches on the menu. I would normally ask: What’s your best-seller appetizer? why? best-seller pasta? why? what makes it distinct? if the waiter is clueless, I would ask: which one do you like best (assuming he has tried everything but this is a bit risky)? what i did was that asked for Mamou to give me advice on the menu instead. never the less, the food compensated well for the minor service issues. We had been in Serendra last week. We were to treat a balikbayan friend at Mamou. We were already seated when the waiter approached us and told us that they have to go out somewhere. They should have not allowed us in and informed us at the door! Some people were still eating that time. We just tried Conty’s across! Last time we tried Abe Hopefully next time, it would already be Mamou! Thanks for the great reviews. Are You Ready For The Ultimate Marketmanila Lechon Eyeball 2008??? 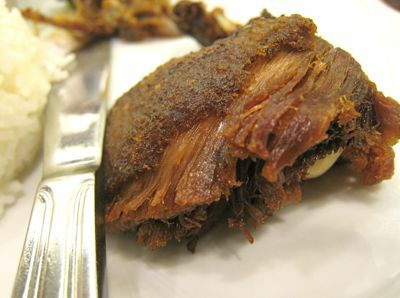 Zubuchon’s Three-Hour Slow Cooked Adobo — Charcoal or Gas?! ?